While oils and fats have become public enemy #1 in a healthy diet, olive oil is recommended by medical and nutritional experts as a "good" fat due to its heart-healthy properties. But did you know the benefits of this miracle substance go beyond nutrition? We've assembled a list of some of the more surprising non-food uses for olive oil. You may even decide to keep a bottle in each room of your Springs Apartments home! Add a few drops of olive oil to a cotton ball for a natural makeup remover. Exfoliate your skin with a fresh-smelling mixture of olive oil, sugar and lemon zest. Who needs expensive night creams? Mix 1/2-cup olive oil and 1/4-cup each of vinegar and water. The acid in the vinegar loosens dead skin cells and kills bacteria while the olive oil moisturizes your complexion. You can also rub olive oil directly on typically dry areas such as elbows and heels. Out of shaving cream? Olive oil makes a good substitute. Keep your hair sleek and smooth on humid days by combing a bit of olive oil through it. 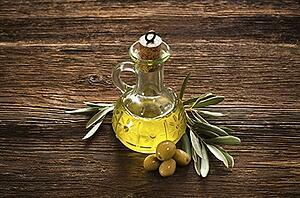 For a DIY hot oil treatment, heat (don't boil) 1/2-cup of olive oil and work it generously through your hair. Cover hair with a plastic grocery bag, wrap with a towel and leave in for 45 minutes. Follow with a thorough wash and rinse. Gently apply a coat of olive oil to your baby's bottom to soothe diaper rash. Cut through automotive grease or paint on your hands by scrubbing them with one teaspoon each of olive oil and salt or sugar. A few drops of olive oil on a sticky door hinge is an eco-friendly alternative to WD-40. Loosen a stuck zipper by rubbing the teeth with a cotton swab dipped in olive oil. Combine two parts olive oil and one part lemon juice or white vinegar in a clean spray bottle and shake to mix. You'll have an effective furniture polish that will restore shine to dull wood. Clean and polish stainless steel and brass items by buffing them with a soft cloth moistened with olive oil. A teaspoon of olive oil in cat food keeps her coat shiny and helps to prevent hairballs. Make cooking clean-up easier by rubbing olive oil into measuring cups or spoons before adding syrup, honey or other sticky substances. Multi-tasking with natural products like olive oil saves money and contributes toward a green lifestyle. Do you use any other items for double-duty in your household? Share your ideas in the comments!